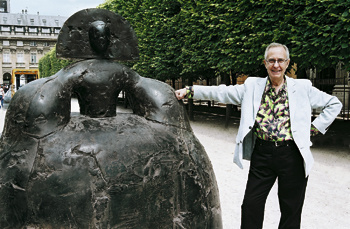 For the whole summer walkers along Esplanadi in Helsinki will enjoy the company of 21 bronze statues made by internationally famous Spanish artist Manolo Valdés. Las Meninas were maids of honour at the 17th Century Spanish Court, immortalized by Velázquez in his masterpiece Las Meninas which is exhibited in El Prado Museum in Madrid. FREE! Magazine was able to have a brief talk with Manolo about his impressions and feelings about his work, which has been placed in such an important location in the heart of Helsinki. Manolo, why have you lived in New York so long? Yes, I have lived there for 18 years. It is a city where I can learn a lot, that suits me very well, and nowadays I do not feel so far from my native Spain. I can enjoy daily the Spanish press and taking a plane takes only 6 hours to get there… Conditions are easier now. Have you visited Finland before? Yes, I have been here several times. Now conditions are very good because I have been invited to many places and events and I can see the life-style from “inside the house”. How did you come up with the idea of having this worldwide tour of Las Meninas? Initially, they were made to be displayed in the Palais Royal in Paris, and then other cities got interested such as Düsseldorf, Beijing, etc… And of course I am very proud of having them for the whole summer in the centre of Helsinki. You have collaborated with the writer Mario Vargas Llosa. How was the experience? It was very enriching. I made some sculptures and Mario wrote a poem about them. The idea was that the sculpture would be able to talk in 1st person: to mix sculpture and poetry into one artistic representation. Do you have any new projects in mind for the near future? I am preparing an exhibition of portraits and landscapes in New York, and another one in Miami.